Total world military expenditure rose to $1739 billion in 2017, an increase of 1.1 per cent in real terms from 2016, according to new data released by SIPRI this month. 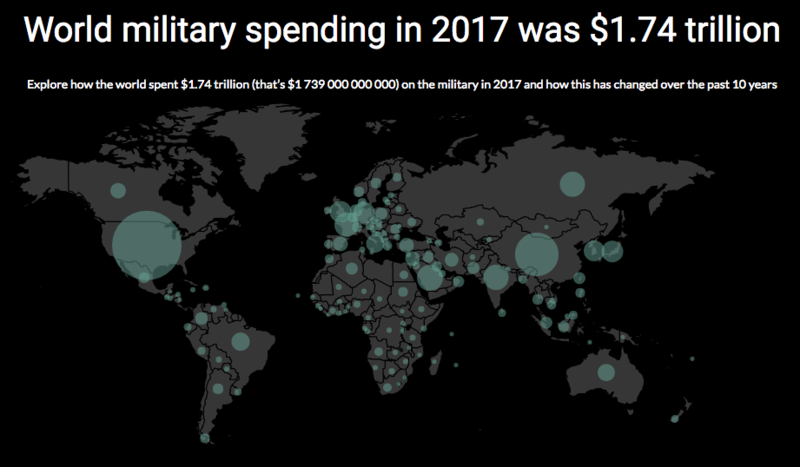 The trends can be explored in more detail on SIPRI’s military expenditure visualization website. 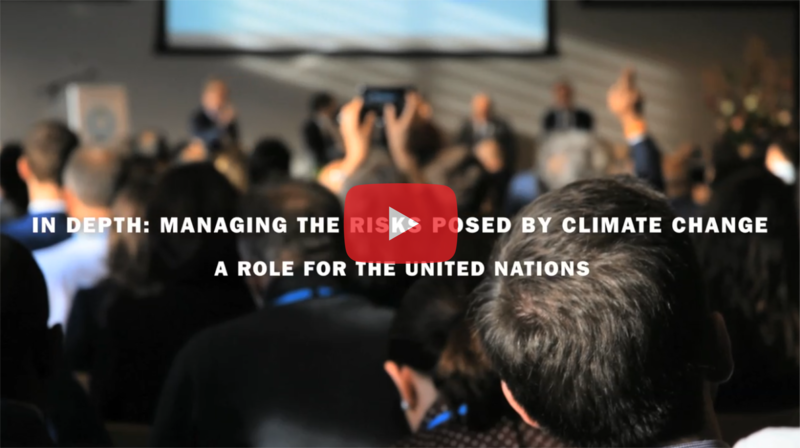 This new SIPRI Searchlight film takes perspectives from key stakeholders on the idea of the United Nations as an institutional home for climate change. It is based on interviews at the 2017 Planetary Security Conference. SIPRI and the Geneva International Centre for Humanitarian Demining (GICHD) have released a new global report of anti-vehicle mine (AVM) incidents in 2017. The report finds 169 incidents related, or suspected to be related, to AVMs in 24 states and territories in 2017. The five states with the highest numbers of AVM casualties in 2017 were Pakistan, Ukraine, Mali, Chad and Yemen. As part of its ongoing work in West Africa and the Sahel, SIPRI has engaged with its partner organization in Mali, CONASCIPAL (National Coalition of Civil Society for Peace and the Fight Against the Proliferation of Light Weapons), to convene a number of events highlighting the differing perceptions of security in Mali. Kolja Brockmann, Mark Bromley and Giovanna Maletta outline SIPRI’s ongoing efforts to promote effective implementation of the Arms Trade Treaty (ATT). The online database for Mapping ATT-relevant cooperation and assistance activities was recently expanded to include East Asia and South East Asia. It is currently being enlarged to cover the Middle East and North Africa. In the context of the 2018 Stockholm Forum on Peace and Development, which was held this month, Rhodri Williams, from Forum partner International Legal Assistance Consortium (ILAC), reflects on the theme of this year’s Forum, ‘The Politics of Peace’. SIPRI and the Ministry for Foreign Affairs of Sweden will host the international conference ‘Managing complexity: Addressing societal security challenges in the Baltic Sea region’. The conference will discuss how to provide safety for citizens and build effective resilience in the face of various contingencies, ranging from climate change to extremism and major infrastructural disruptions. SIPRI at Almedalen: Hunger and conflict—where is the connection? On 24 May, the United Nations Security Council recognized for the first time that armed conflict and violence are closely linked to food insecurity. SIPRI in cooperation with the World Food Programme (WFP) will host an event in Almedalen, Gotland, to discuss this connection. For further details please contact Emma Fredriksson, SIPRI Event Coordinator (emma.fredriksson@sipri.org). The inaugural SIPRI Lecture on the theme ‘Is the world on the road to peace or war?’ was delivered by HE Dr Hans Blix in the presence of His Majesty Carl XVI Gustaf and Her Majesty Queen Silvia. The event, opened by Ambassador Jan Eliasson, Chair of the SIPRI Governing Board, also featured a panel discussion moderated by Dan Smith, SIPRI Director. SIPRI and the Swedish Ministry for Foreign Affairs hosted the 2018 Stockholm Forum on Peace and Development on the theme, ‘The Politics of Peace’. On the opening public day—which featured two high-level plenary sessions—over 700 participants were present. Inclusivity was stressed as the key for lasting peace as participants focused on identifying tangible steps towards creating sustainable peace. World military expenditure is estimated to have reached $1739 billion in 2017, the highest level since the end of the cold war. After 13 consecutive years of increases from 1999 to 2011 and relatively unchanged spending from 2012 to 2016, total global expenditure rose marginally in 2017, by 1.1 per cent in real terms. 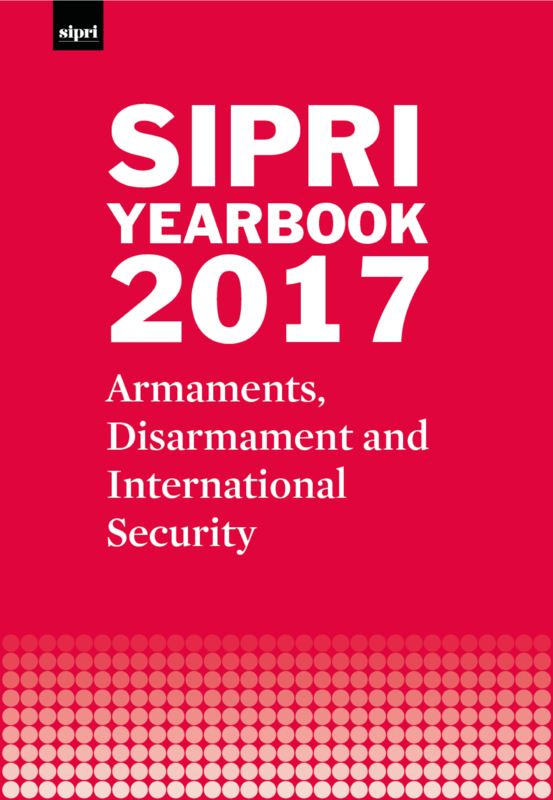 This Fact Sheet highlights the regional and national trends in 2017 and over the decade 2008–17 shown by new data from the SIPRI Military Expenditure Database. The need for systematic data collection on AVM incidents was first recognized during joint research by the GICHD and SIPRI for a study on the humanitarian and developmental impact of AVMs published in October 2014. As a response, both organizations have been collecting global data on AVM incidents since 2015 with a view to improving evidence on and identifying trends in AVM impact. This report presents and analyses AVM incident data from 2017.